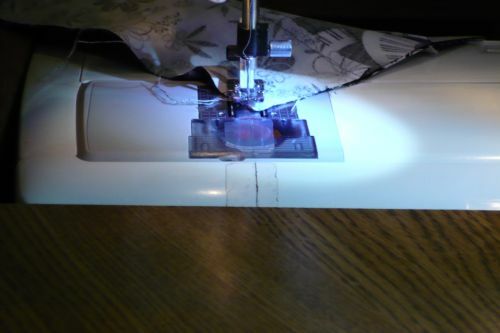 Recently the LQS and quilting cataglogs started carrying a stick on light for sewing machines. Some of my friends have it, but to me it costs more than I’m willing to spend at this time. Today, while DH and I were out running errands, I found an inexpensive alternative. It is a Coast Tackle Box Light. At the time, I wasn’t positive that I would be able to use it on my sewing machine, but was confident, I could use it for something, and it was only $5. Well, I must say, it does put a little light on the subject. I’ve clipped it to the ‘hood’ of my sewing machine. It’s too heavy to for the hood to stay up, so when I’m using cone thread, I’ll have to figure something else out. But for $5, what a deal. Now, back to the black & white Strip Twist. you have some excellent fabric choices you are working with, I’ve looked back thru your blog, I think the button fabric is a light also!